If you have ever had to deal with a particular dry patch, or thatch fungus, you will know and understand the importance of wetting agents. 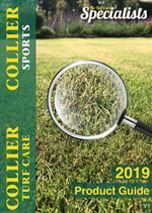 At Collier Turf Care, we sell a complete range of granular wetting agents. As well as this there are liquid wetting agents and dew dispersers. If you are looking for wetting agents for lawns we sell these too. So, if you're lawn is in urgent need of attention trust our range of products to keep your grass green all Summer long. With climate change, and an increasing level of ground temperatures throughout the year in the UK, it is more than likely that you will need a wetting agent to work alongside irrigation. We stock brands including Revolution, Dispatch and H2Pro; Qualibra & Prestige.